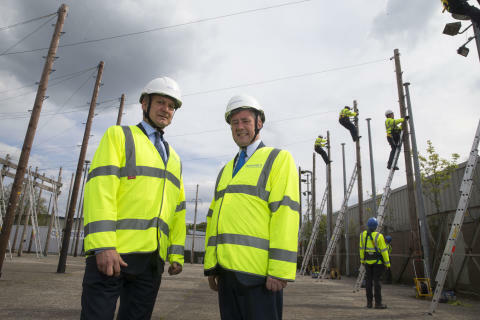 Openreach chief executive Clive Selley today announced a £400,000 investment in a fibre training school for Scotland to educate a new generation of digital engineers. More than 4,000 people have applied for 400 new trainee engineering roles being created in Scotland by the digital network business as it gears up for a major rollout of ultrafast broadband. The new recruits will be among the first pupils to pass through the new fibre training school, located within Openreach’s national training centre for Scotland in Livingston, with around 40 being hired to work directly on the rollout of Fibre-to-the-Premises (FTTP) in Edinburgh. The Scottish capital will be the first city in Scotland to see widespread rollout of FTTP at speeds up to 1Gbps*. Work is under way in parts of the city including Corstorphine and Newington, with places like Murrayfield, Abbeyhill and western Dalry expected to follow. Visiting the Livingston training centre today, Keith Brown MSP, Cabinet Secretary for the Economy, Jobs and Fair Work, welcomed the latest investment on behalf of the Scottish Government. Clive Selley said: “When it comes to delivering world class digital infrastructure, Openreach people in Scotland have unrivalled experience, expertise and capability – and we want that to continue. “Our new engineers are helping us provide better service, broader coverage and faster broadband speeds throughout the country, and this new training school will make sure they have the skills they need to get the job done. During the visit, the Cabinet Secretary and CEO visited the first of four new fibre classrooms at the centre – designed to provide a real-life setting for trainees complete with duct pipes, fibre cables and walls replicating inside and outside customers’ houses – and met Openreach trainees. During this year a residential street will be replicated outside the centre to give recruits a safe, real-life environment to learn and practise every aspect of their work. It will have a live, fibre network which connects a local exchange to an office, shop and houses through pavements, ducts, poles and cabinets – with an extra dose of reality added by exposure to the elements. The indoor and outdoor simulations are designed to include everything an engineer would encounter during a typical working day - from cabling to jointing and repairs, working underground or overhead, up telephone poles and installing new services inside customers’ homes. Engineers who pass through the fibre training school will receive comprehensive training – from picking up a job and setting up their working area safely to splicing together hair-breadth fibres or installing or repairing a line. Around 1,700 trainees are expected to pass through the doors in Livingston throughout 2018/19, with numbers rising once work completes on the fibre school later this year. More than 95 per cent of Scottish homes can already access fibre broadband services, through commercial investment and Openreach’s Digital Scotland partnership with the public sector, with the vast majority able to attain speeds of 30Mbps+. As well as being the first Scottish city, Edinburgh is one of only eight in the UK at the forefront of Openreach’s Fibre First programme, which will see three million homes and businesses upgraded to ultrafast FTTP by the end of 2020. The capital joins places like Altnaharra in Sutherland and Innerleithen in the Scottish Borders which already have some FTTP capabilities, alongside around 8,000 premises which now have access to FTTP as part of the Digital Scotland Superfast Broadband rollout led by the Scottish Government and Highlands and Islands Enterprise. Openreach expects to announce more locations to be upgraded to ultrafast FTTP during the course of this year.